NHLPA Goals & Dreams ensures the great game of hockey is available to as many children as possible, a priority to the players. Learn more about how the players give back to their roots in part two of this three-part series. Four hundred current and former players have all been actively involved with G&D to make equipment donations to grassroots programs in their local communities. Over the years, NHLPA Goals & Dreams (G&D) has worked with charitable organizations both large and small, helping kids from all corners of the world. The players’ program has also assisted some of the most recognizable charitable organizations in North America, including the likes of KidSport, Right To Play, the Herb Brooks Foundation, Teammates for Kids, the United Heroes League and Project North. Towards the start of this hockey season, G&D announced a donation of $150,000 worth of brand new hockey equipment to 12 youth hockey programs throughout the first round of 2017-18 distributions. Among the recipients are Northern Ontario Families of Children with Cancer, a hometown program near and dear to G&D ambassador and Florida Panthers captain Derek MacKenzie’s heart. “It’s really hard to explain that when you come from a small town, you really do know everybody in some way, shape or form,” MacKenzie told NHLPA.com in November. “I think it’s (Goals & Dreams) such a generous program. To know that it’s truly helping kids, it’s so appreciated.” The players’ undivided support of the military and police services can also be found in the numerous donations of gear to programs developed and operated by the men and women who serve their respective countries. Brent Burns, whose family has deep military roots, sees G&D as the ideal platform for the players to share their passion and pride for hockey. He has been involved in multiple G&D donations, including a 2015 donation and event with then-Sharks teammate Paul Martin to United Heroes League (formerly Defending The Blue Line), an organization that provides children of military members the chance to play hockey. The defenceman is one of many big-league players – past and present – who share that same sentiment. “When you go into these communities, you realized just how much hockey means to these people,” said Mike Gartner, former NHLPA Director of Business Relations. “A lot of these are smaller communities and you see how much it was appreciated that the players, through the Players’ Association, it was all of their own money, through licensing revenue, none of the money was donated. It was through the players themselves. Whether it was or 20 or 50 sets of equipment, the look on those kids’ faces – they had never received any new equipment – it was very rewarding to do from our perspective. A lot of parents had tears in their eyes watching their kids get new equipment or having their arena refurbished. Nearing its 20th anniversary, while the program has evolved and grown, G&D continues to model its efforts around that very first mission statement: ‘to assist in developing hockey on the grassroots level around the world.’ Former NHLPA Executive Director Bob Goodenow also knows that the meaning of the program – to the players – endures. “Players always appreciate their roots, their first team, their first teammates,” said Goodenow. “And players appreciate how difficult it is at times to have the equipment, to have the facilities. Goals & Dreams is players saying, ‘What can we do more of?’ Goals & Dreams is a real grassroots thing. Players love it because they can go back home. Through the donation of equipment grants – the current focus of the program – more than 70,000 children have received the chance to play hockey and benefit from the sport’s commitment to teamwork, discipline and physical fitness. The players’ program also previously assisted with upgrades and the building of hundreds of arenas worldwide. This 2017-18 hockey season, the National Hockey League Players’ Association (NHLPA) celebrates the 50th anniversary of when it was established by the Player Representatives in June 1967. Originally, the Players' Association was formed by Ted Lindsay (President), Doug Harvey (1st Vice President), Fern Flaman (2nd Vice President), Bill Gadsby (Treasurer) and Jim Thomson (Secretary), to promote, foster and protect the interests of players. Though the Association would initially be stifled by management, the efforts of those players laid the groundwork for the formation of the current NHLPA. In 1967, the NHLPA was formally ratified as a labour organization whose members are the players in the NHL. Learn more about the NHLPA and its storied members, both past and present, through NHLPA.com as well as your social media feeds by tracking #NHLPA50. 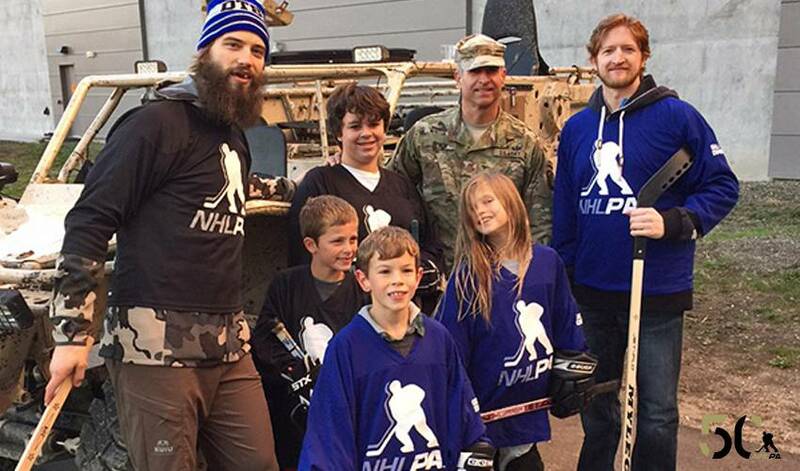 The UHL and NHLPA have announced the winners of the All-Star Hero campaign, which recognizes military personnel and their families for their services through the players’ NHLPA Goals & Dreams fund. The UHL and NHLPA through the Goals & Dreams fund have announced the launch of the All-Star Hero campaign to recognize military personnel and their families for their services. There aren’t many days, if any, that the Florida Panthers captain doesn’t think about the many kids and families he’s met through Northern Ontario Families of Children with Cancer (NOFCC). Brent Burns is a first-time Ted Lindsay Award finalist and is the first defenceman to be voted a finalist in 17 years. Burns set single-season franchise records with the San Jose Sharks for goals and points by a defenceman.